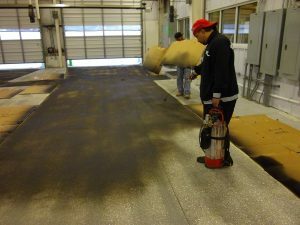 We use several techniques for concrete resurfacing include Shot Blasting, Scarification, and Diamond Grinding to prepare concrete surfaces for coating or painting. 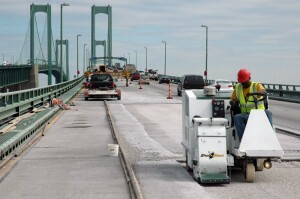 Shot blasting is an essential part of a long lasting concrete surface. Shot Blast Inc has completed shot blasting on hundreds of big projects in our area. Shot Blasting for over 35 years! The art of grinding, densifying (hardening concrete), honing, and polishing up to 1,600 grit using Planatary grinders and diamond segments. Shot Blast Inc. strives to meet and exceed customer expectations with great service. We have collected some of our customer’s feedback in our testimonials section. “Your company was selected because of a strong referral from another contractor, and we have been very happy with every aspect of your service…” – Dave Warner, Project Manager at Buckley & Company, Inc. Shot blasting is the process of blasting a concrete surface with small steel balls at a high velocity. This removes the soft concrete for improved bonding. 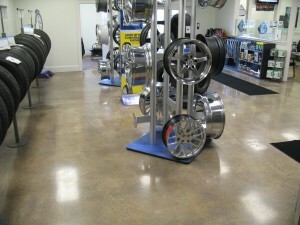 Diamond grinding will clean and resurface the concrete leaving the surface smooth. This method is perfect for preparing the substrate for very thin applications and sealers. Concrete polishing can transform floors in industrial, commercial, and residential settings with a high gloss finish that is both durable and beautiful.